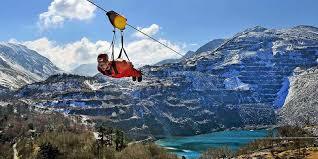 Set in North Wales near the stunning Snowdon range, in what once was the world’s largest slate quarry, Penrhyn Quarry is now home to the fastest zip line in the world, Velocity 2, where you can fly 500m above the bright blue quarry lake. Sign up today for the World’s fastest and Europe’s longest zip wire and feel like you are flying in a picturesque North Wales valley. Registration is only £20 with a £200 fundraising target. Email zoe@alexswish.co.uk to book your place below if you love heights, your heart in your stomach and the feeling of weightlessness.